Charlton Athletic season ticket holders can gain free entry for their women’s team’s FA Women’s Premier League Cup clash with Brighton at Bayliss Avenue, Thamesmead, this Sunday (Oct 14, KO 2pm). While the men’s team have the weekend off, the Charlton women’s team go into their second league cup game off the back of successive wins, showcasing two different sides to their game. Two weeks ago they demolished Portsmouth 7-2 at home thanks to a Gemma Bryan hat-trick before traveling to Cardiff and coming away with a hard-fought 1-0 win – Bryan getting the goal once again. The Addicks’ first league cup group stage game was a convincing 4-1 win over rivals Gillingham and, with the confidence flowing, caretaker manager Bill Long hopes to make a real impact on the competition. He said: “It will be a good game against Brighton. We want to do well in the cups and go as far as we can so we will put out our strongest possible team. Hopefully we can dig out another win. “They are going to come out and up their game because they are coming to a National Division side and we have to be ready for that. 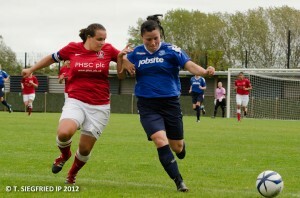 Captain, Kim Dixson, who is a Charlton season ticket holder herself and has over 100 appearances for the club, is hoping she will be lifting silverware come the end of the season. She said: “Getting our first win of the season last week gave everyone a boost and we knew we could do it again today. “We have two cup games coming up and hopefully we can carry on that winning mentality, not concede goals and score as many as we can. “One of my aims this year is to win some silverware. We let ourselves down in the London Cup last year, losing in the semi final to Tottenham, and that has haunted me for a whole season now. Ticket prices: Charlton and Thamesmead Town season ticket holders can enter for free. Non season ticket prices are adults £4, concessions £2.